Be the first to share your favorite memory, photo or story of Avigail. This memorial page is dedicated for family, friends and future generations to celebrate the life of their loved one. 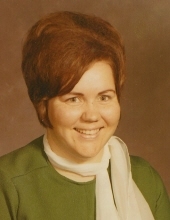 Avigail Miller, 71, of Moss Point, MS, passed away on Tuesday, March 26, 2019 in Pascagoula, MS. Avigail was born on December 4, 1947 in Sumrall, MS to the late Roy and Lizzie Deen Miller. She taught at Escatawpa Elementary as a first grade teacher for 35 years. She was a dedicated member of Escatawpa Baptist Church, where she taught Sunday school, bible school, helped with sign language interpretation, and was a longtime pitcher for the women’s softball team. Avigail was also past Worthy Matron of the Eastern Star. In addition to her parents, Avigail was preceded in death by her brothers, Thomas, Terrell, Talmadge, and Robert Miller and her grandson, Tyler. She is survived by her siblings, Joseph “Jody” (Sharon) Miller, Roy Deen (Jacque) Miller, Annette Miller, and Clara (Bobby) Sanford; nieces and nephews whom she considered her own, Robin, Robert “Will”, and Ramanda and was a loving Mimi to their children, Dylan, Haley, Gavin, Jasmyn, Alex, Addison, and Robert; along with numerous other nieces, nephews, other family members, and friends. The visitation for Avigail will be held on Friday, March 29, 2019 from 6:00 p.m. until 9:00 p.m. at Heritage Funeral Home in Escatawpa, MS. The funeral service will be held on Saturday, March 30, 2019 at 12 noon at Hulett-Winstead Sumrall Chapel, 150 Crossland Rd. Sumrall, MS 39482. The family will receive friends for one hour prior to the service. Interment will follow at Advance Cemetery in Sumrall. Heritage Funeral Home, locally owned and operated, is in charge of arrangements. To send flowers or a remembrance gift to the family of Avigail Miller, please visit our Tribute Store. "Email Address" would like to share the life celebration of Avigail Miller. Click on the "link" to go to share a favorite memory or leave a condolence message for the family.